Q&A: Dark matter next door? Astrophysicists Eric Charles and Mattia Di Mauro discuss the surprising glow of our neighbor galaxy. Astronomers recently discovered a stronger-than-expected glow of gamma rays at the center of the Andromeda galaxy, the nearest major galaxy to the Milky Way. The signal has fueled hopes that scientists are zeroing in on a sign of dark matter, which is five times more prevalent than normal matter but has never been detected directly. Researchers believe that gamma rays—a very energetic form of light—could be produced when hypothetical dark matter particles decay or collide and destroy each other. However, dark matter isn’t the only possible source of the gamma rays. A number of other cosmic processes are known to produce them. So what do Andromeda’s gamma rays really tell us about dark matter? 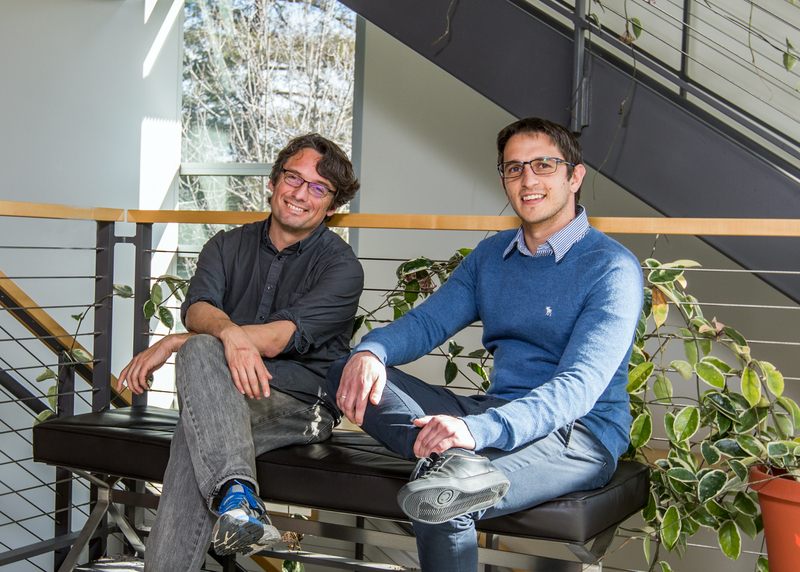 To find out, Symmetry’s Manuel Gnida talked with Eric Charles and Mattia Di Mauro, two members of the Fermi-LAT collaboration—an international team of researchers that found the Andromeda gamma-ray signal using the Large Area Telescope, a sensitive “eye” for gamma rays on NASA’s Fermi Gamma-ray Space Telescope. Both researchers are based at the Kavli Institute for Particle Astrophysics and Cosmology, a joint institute of Stanford University and the Department of Energy’s SLAC National Accelerator Laboratory. The LAT was conceived of and assembled at SLAC, which also hosts its operations center. Have you discovered dark matter? No, we haven’t. In the study, the LAT team looked at the gamma-ray emissions of the Andromeda galaxy and found something unexpected, something we don’t fully understand yet. But there are other potential astrophysical explanations than dark matter. It’s also not the first time that the LAT collaboration has studied Andromeda with Fermi, but in the old data the galaxy only looked like a big blob. With more data and improved data processing, we have now obtained a much clearer picture of the galaxy’s gamma-ray glow and how it’s distributed. What’s so unusual about the results? As a spiral galaxy, Andromeda is similar to the Milky Way. Therefore, we expected the emissions of both galaxies to look similar. What we discovered is that they are, in fact, quite different. In our galaxy, gamma rays come from all kinds of locations—from the center and the spiral arms in the outer regions. For Andromeda, on the other hand, the signal is concentrated at the center. Why do galaxies glow in gamma rays? The answer depends on the type of galaxy. There are active galaxies called blazars. They emit gamma rays when matter in close orbit around supermassive black holes generates jets of plasma. And then there are “normal” galaxies like Andromeda and the Milky Way that produce gamma rays in other ways. When we look at the emissions of the Milky Way, the galaxy appears like a bright disk, with the somewhat brighter galactic center at the center of the disk. Most of this glow is diffuse and comes from the gas between the stars that lights up when it’s hit by cosmic rays—energetic particles spit out by star explosions or supernovae. Other gamma-ray sources are the remnants of such supernovae and pulsars—extremely dense, magnetized, rapidly rotating neutron stars. These sources show up as bright dots in the gamma-ray map of the Milky Way, except at the center where the density of gamma-ray sources is high and the diffuse glow of the Milky Way is brightest, which prevents the LAT from detecting individual sources. Andromeda is too far away to see individual gamma-ray sources, so it only has a diffuse glow in our images. But we expected to see most of the emissions to come from the disk as well. Its absence suggests that there is less interaction between gas and cosmic rays in our neighbor galaxy. Since this interaction is tied to the formation of stars, this also suggests that Andromeda had a different history of star formation than the Milky Way. 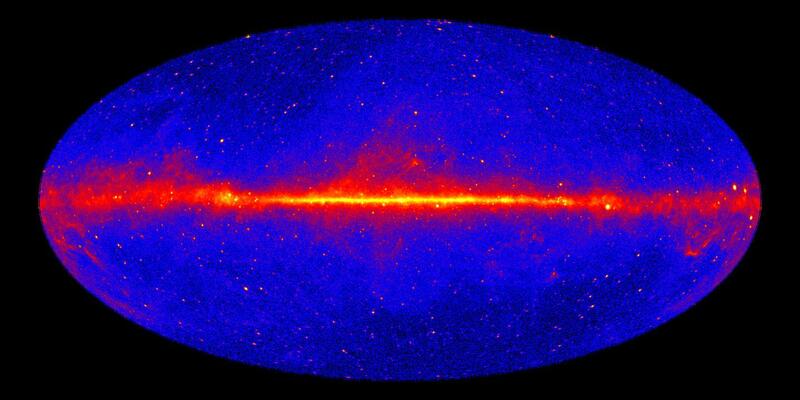 The sky in gamma rays with energies greater than 1 gigaelectronvolts, based on eight years of data from the LAT on NASA’s Fermi Gamma-ray Space Telescope. What does all this have to do with dark matter? When we carefully analyze the gamma-ray emissions of the Milky Way and model all the gas and point-like sources to the best of our knowledge, then we’re left with an excess of gamma rays at the galactic center. Some people have argued this excess could be a telltale sign of dark matter particles. We know that the concentration of dark matter is largest at the galactic center, so if there were a dark matter signal, we would expect it to come from there. The localization of gamma-ray emissions at Andromeda’s center seems to have renewed the interest in the dark matter interpretation in the media. Is dark matter the most likely interpretation? No, there are other explanations. There are so many gamma-ray sources at the galactic center that we can’t really see them individually. This means that their light merges into an extended, diffuse glow. In fact, two recent studies from the US and the Netherlands have suggested that this glow in the Milky Way could be due to unresolved point sources such as pulsars. The same interpretation could also be true for Andromeda’s signal. What would it take to know for certain? To identify a dark matter signal, we would need to exclude all other possibilities. This is very difficult for a complex region like the galactic center, for which we don’t even know all the astrophysical processes. Of course, this also means that, for the same reason, we can’t completely rule out the dark matter interpretation. But what’s really important is that we would want to see the same signal in a few different places. However, we haven’t detected any gamma-ray excesses in other galaxies that are consistent with the ones in the Milky Way and Andromeda. This is particularly striking for dwarf galaxies, small companion galaxies of the Milky Way that only have few stars. These objects are only held together because they are dominated by dark matter. If the gamma-ray excess at the galactic center were due to dark matter, then we should have already seen similar signatures in the dwarf galaxies. But we don’t.